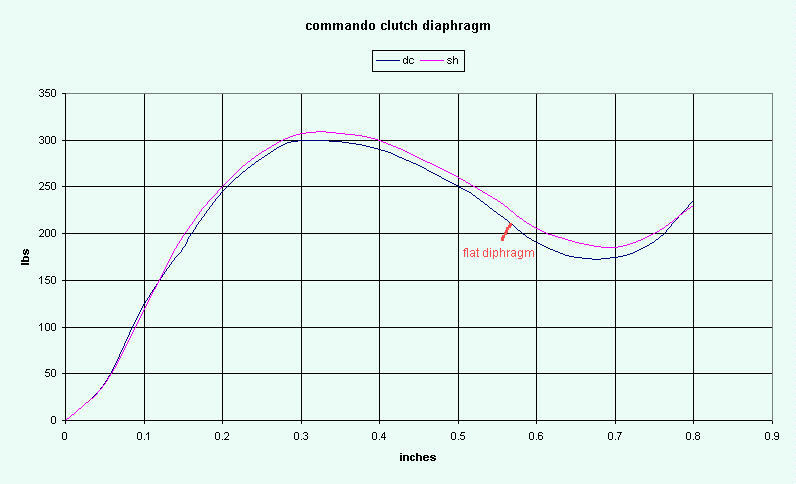 Diaphragm Description The clutch spring in the Commando is a cupped piece of spring steel called a diaphragm. Its center has been cut into 18 radial fingers. A center carrier has 2 rows of slots, 9 per row, alternating HI-LO. These slots in the center carrier receive the ends of the diaphragm fingers. The diaphragm is pressed over the center carrier and 18 fingers get loaded into the 2 rows of slots. The center carrier also carries the clutch adjuster screw and lock nut. To disengage the clutch the following observations can be made. The clutch carrier is pushed out .035" than the clutch starts to disengage. At this point the high fingers have been well lifted and the lo fingers are now just starting to lift off of the clutch pressure plate. By .050" lift both sets of fingers are free and clear of the clutch pressure plate and the clutch should have almost no engaging properties. The atlas actuator cam certainly has more than an adequate lifting range for a commando clutch, and in fact the commando actuator cam has more than double the lift needed to completely disengage the clutch. This makes the ROD/cam ball free play adjustment of little concern in actual use, with the commando actuator cam. Clutch Function 1. The diaphragm (spring), installed in the clutch drum, wants to push-in to squeeze the clutch plates together. If allowed to go in all the way it would take the dished shaped called extended (shown above). Fully extended would be defined as having zero deflection. 2. The second condition is when you apply pressure and deflect the diaphragm outward into a flat shape (flat zone) =clutch engaged. 3. The third condition is when the diaphragm is pushed outward further, beyond flat and will take a reverse dished shape. This is the inverted condition. This happens when you pull on the clutch lever to disengage the clutch. Clutch Diaphragm Chart The clutch diaphragm (spring) was placed in a hydraulic press and set on a scale. As the diaphragm was pressed, the deflection was measured and compared to the pressure displayed on the scale. Please note the chart shows pressure at the clutch center and therefore the pressure on the clutch stack would be approximately double. The diaphragm touches the pressure plate half way to the edge and so doing, doubles the mechanical advantage.. 1. Extended to transition .00” to .35” of Deflection—Fully Extended is when there is .00” deflection, then as the diaphragm is deflected toward transition the peak pressure goes up sharply. 2. Transition Region & Flat Zone .35” to .65” of Deflection—The Transition Region couples the extended and the inverted conditions. 4. Inverted Region .65” & More of Deflection—As the diaphragm approaches flat, a reversal in the diaphragm rate happens because the diaphragm is naturally cupped (extended). When the diaphragm goes in a cupped shape in the inverted mode, the natural cupping action partially counteracts the diaphragm rate. This accounts for the dip in the diaphragm pressure. Cable Oiling This is significant! Always lubricate your clutch cable, especially at the beginning of the riding season. If you ride lot and in hot weather, repeat as necessary. May not be necessary on teflon lined cables. 1. remove your cable from the bike. 2. Use a baggie and rubber band to make a funnel on one end. 3. put some oil in and hang up and leave until oil comes out bottom of cable. 4. reinstall using correct routing. Cable - Radius of Bend This is also significant! A incorrectly routed cable will bind, causing unnecessary friction and drag. It may also then cause sudden jerking clutch engagement when released . Many cables are actually to short to allow large radius curves. Refer to “Clutch Cable Routing” drawing. Replace with longer one if necessary to get nice large radius curves. Clutch Adjuster The clutch adjuster DOES NOT HAVE ANY AFFECT on a hard pulling clutch. Screw the clutch adjuster 1/2 to 1 turn out. Just make sure it doesn't touch while disengaged. As the clutch wears, the adjustment clearance decreases and may eventaully touch. Clutch Actuator Mechanism Orientation The normal shop manual procedure should be adhered to. The cable and mechanism should aim toward the cable entrance hole. Clutch Actuator Roller The roller has been know on occasion to rust up and no longer rotate as it should. This can also causes a high drag load and makes the clutch release effort go up. Even if freed up, it will then likely have a worn "flat" spot and should be replaced anyway. Atlas Actuator The Atlas actuator has 50% more mechanical advantage than the commando. While this is used with success, it shouldn't be necessary on a properly maintained and assembled commando. 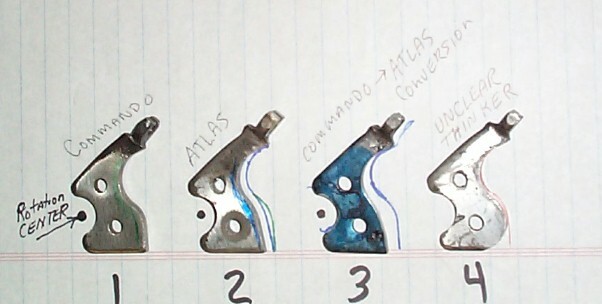 commando/atlas clutch arms comparison A commando clutch with an atlas clutch rod actuator will easily become a "pinkie" 1 finger actuated clutch. clutch arms modified Clutch Stack Height Since the easiest clutch is when the clutch diaphragm spring is about .68” of deflection (175 lbs) and clutch pull is about .1”, the engaged position should be around .58” of diaphragm deflection to get the sweet spot. Therefore, the diaphragm appears to be about .03” inverted beyond flat (.55”) when engaged. The problem is how do you get the diaphragm to be at a certain position when assembled? You adjust the internal clutch stack height, the diaphragm is usually extended a bit to much. Therefore, you add thickness to a component in the clutch stack height. You could have a custom (thicker) backing plate made to be placed in the rear of the clutch basket, or you can add a clutch steel plate .080” thick. You can see using a straight edge on the diaphragm, if it is flat, extended or inverted. It is interesting to note that as the clutch wears, it always gets harder to pull until it finally gets to .40”extended. Then its up to 325lbs of pressure! I don't necessarily endorse this as a must do modification. But you should understand what is happening if you decide to go through with it. The lowered clamping pressure may cause slipping. No Drag - No Slip Clutch I doubt the norton commando factory has ever advertised that the primary with a chain should be run dry. The clutch may have been designed by an outside vendor for dry service, but then the factory would have knowingly installed a dry clutch into a wet application. Regardless of the reason for slipping, the results are all to real to the owner/rider and therefore making the dry clutch design argument a rather moot point. A notched clutch center may be a possible cause for clutch dragging, but it is likely not the most common cause on Commandos. Much has been written about slipping/dragging clutches; cleaning in gasoline, sanding, sandblasting, etc. Overfilling the primary is sometimes a contributing factor to a slipping/dragging clutch. The most prevalent culprit on the Commando is gearbox 90W oil dripping out of the transmission main shaft and onto the clutch plates. The question is, how do I fix this leak? Simple, put a clutch rod seal. 1. Some people in the past have cut the pushrod shaft and put a 1/4" ball bearing. Some people have reported decreased flow into the clutch. 2. Others have cut a groove in the 6mm rod for an o-ring. The inside of the mainshaft is VERY rough for sealing to an buna-n oring. They probably don't last long before they get eaten up. 3. Over 3000 clutch rod seals have been installed. It seems to be completely successful controlling gearbox oil migration 99.9% of the time.